1Password Mini is awesome. So awesome in fact that I prefer it and its key combinations over the browser extensions, so I leave them non-installed. My tiny gripe is that Mini constantly prompts me to install the browser extensions when first opened (see screenshot). It would be nice to dismiss this notification, since if I've chosen to ignore it for this long, I probably don't want to see the reminder. @landen: That's certainly an interesting take. 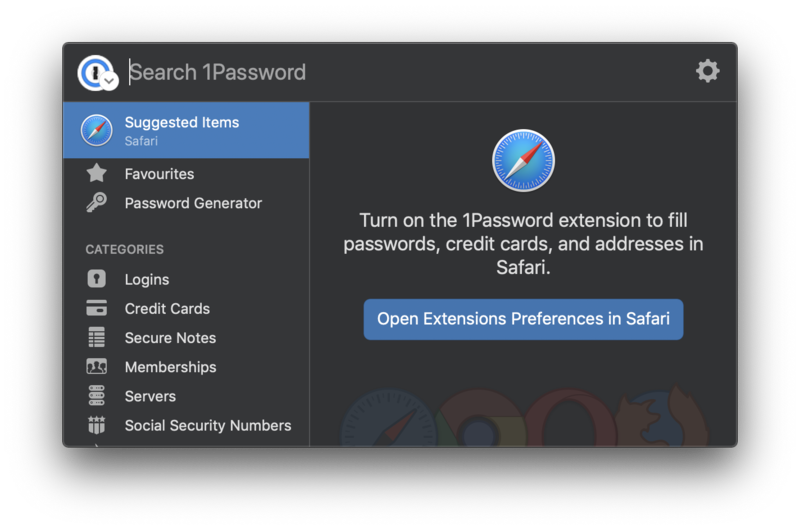 Most people use 1Password almost exclusively in their browsers, so that's what we design around. I'm not sure I see that changing anytime soon. But I'd like to understand more about what you're trying to accomplish. To be clear, when you're using the 1Password desktop extension in your browser, it is 1Password mini. So I'm not sure what not installing it gets you. There are some advantages to having it of course: convenience, in that it can save and fill login credentials for you; but on the flip side, there's a security benefit to not copying and pasting passwords, since the clipboard is exposed to whatever you're interacting with. Using 1Password's filling capability protects against some classes of attacks by bypassing the clipboard. Anyway, let me know, and maybe I can suggest something or offer some additional insight.